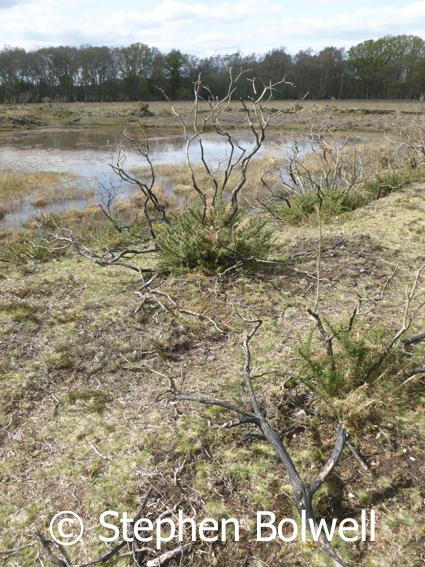 The New Forest’s Overgrazed Heathlands. 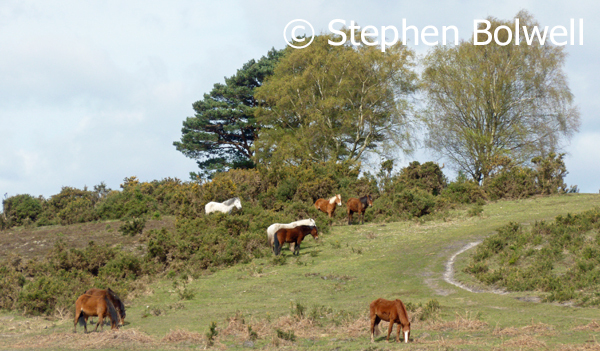 Overgrazing the New Forest – a major contribution to species decline. I wrote recently about ‘The New Forest’ and the obvious truth that it has a litter problem, but there is something more consequential going on that has been bothering me for years – the fabric of the Forest is being eaten away by herbivores more quickly than it can regenerate, and rather like the litter – there is no sign of a change for the better. 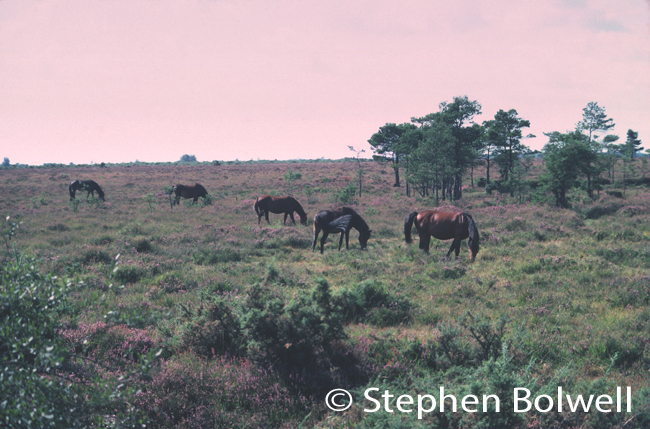 New Forest ponies in a mixed open habitat that is now heavily grazed. Picture: April 2016. 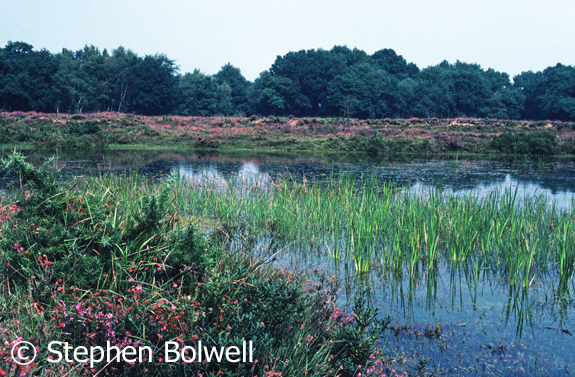 The New Forest, for those who don’t already know, is a patchwork of habitats ranging from lawns, through open heathlands to forests and all are maintained by grazing. This has been achieved through the centuries by giving local people the ‘right’ to graze livestock on the open Forest and those entitled to exercise their ‘common rights’ are known as ‘commoners’. A pony and foal crossing the heath. Summer 2000. The look that is achieved with this approach to management isn’t exactly wild, but neither does it feel agricultural – it’s somewhere in between and usually happens in areas where the soil is too poor to support more intensive forms of agriculture. If such places were left to their own ends they would eventually return to the wild. The British have always had an uncomfortable relationship with wilderness, we pretend to like it, but in truth we can’t seem to leave the natural world alone. Every available space, especially common land has to be useful and any environment that hasn’t already been utilised is just begging to be grazed, rather than allowing them to return to overgrown wastelands – the terror of it! The New Forest is no exception; in ancient times it was often described as a furzey waste. The prevailing view is, that if we can’t make use of such places, then they are no use at all. A view across the ‘furzey waste’ as it was in late summer 2000. The idea that every bit of land has to be owned by somebody, or at the very least has to be useful in some way is ingrained in us – it’s almost a religion. We believe it because our predecessors believed it – a process that has gone on for generations, with nobody stopping to ask: would the natural world really be such a bad place if we just left it alone? Sadly, this is an errant thought because it’s never going to happen, particularly in the New Forest where local people see grazing livestock as their birthright. So, what exactly does that leave us with? Apparently something that’s not half bad; semi-natural habitats maintained by the munching of farm animals which benefits a variety of plant and animal species when it is done right. Ponies, cattle and in some places sheep – these in very low numbers, wander the open Forest all year round. And during autumn, pigs are turned out to feast on fallen acorns that ponies would otherwise fill up on and poison themselves – they are a bit stupid like that. Pigs on the other hand seem able to convert almost anything into bacon. 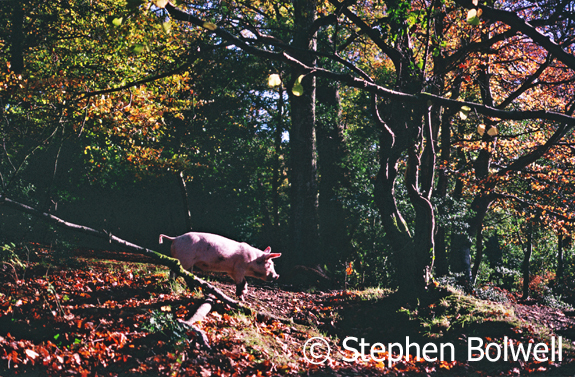 A presumably happy pig on his way in search of acorns or anything else he can snuffle up. Autumn 1999. Fritham. The big question is: how much grazing does the Forest need to maintain healthy eco-systems and when does it become too much? Even to an untrained eye the New Forest is presently going through a prolonged phase of overgrazing – and with all of the other pressures that now exist – probably one of the worst that has occurred during its long history. 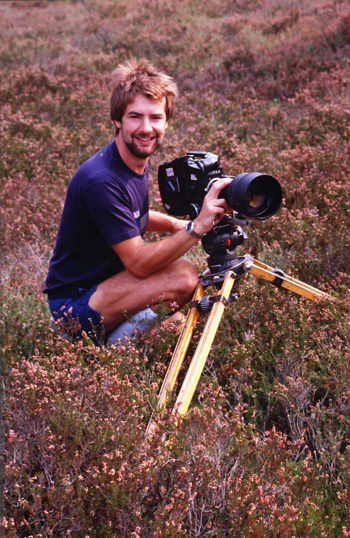 When I was filming wildilife for the BBC back in the 1980s the heathlands were healthier – that’s not to say that there’s no mature heather now, but back then it was more extensive and less damaged than it is today and sometimes deep enough to hide in. In 2010 Natural England designated 16 million pounds to encourage the ancient right of commoning, essentially to promote grazing. In April 2016 under a partly European funded Verderers’ Grazing Scheme the pot was increased to 19 million pounds which allowed a per annum payout for each animal of around 85 pounds for cattle and just short of 70 pounds for each pony. A recent EU-funded ‘Basic Payment Scheme’ was introduced to help farmers in general, which might entitle commoners to a payment just short of 250 pounds for each of their cattle and 269 pounds for each pony, with no cap on the number of animals for which payments can be made. Essentially this has become a licence to print money for anybody living in the Forest exercising their grazing rights, which is an extrordinary deal considering that the land being utilised doesn’t belong to those who are putting stock out. So, everybody and his auntie must have joined in by now because it’s a no-brainer. I don’t know of any commoners who would be ostentatious enough to wallpaper their bedrooms with fifty pound notes, but many will have at least taken the opportunity to update their four wheel drives. 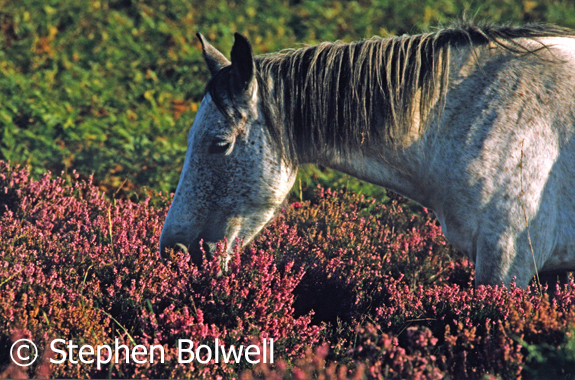 A New Forest pony in beautiful deep heather back in summer 2000. Promoting grazing with financial incentives seemed like a good idea around about the time the New Forest became a National Park, because this was a period when putting animals onto the open forest no longer appeared to be giving a good return and for many commoners didn’t seem to be worth the effort; stock numbers were beginning to fall, and with few exceptions wildlife was starting to benefit – because creating the right level of grazing is a difficult balance, but a drop in numbers was clearly proving to be good for the environment. Sadly, there was only a short respite. Throughout my lifetime the trend has been for stock numbers to increase, with pony numbers more than doubling in the last half century to around 5,000 and cattle numbers also increasing significantly in recent years. Now that grazing is back with a vengeance the New Forest is looking increasingly like a badly worn pitch and putt – or should that be ‘a badly worn crazy golf course’! – because the traditional furzey waste that has existed for centuries is now in rapid decline. The intention was, “to attract new, younger commoners to continue the traditions that have contributed to the rich biodiversity of the forest”, perhaps this quote should have stopped at “to continue the traditions” because there are no grounds for suggesting that this is contributing to the rich biodivesity of the Forest. The good news continues with, “to preserve the rich beauty of these acres” which might be nearer the truth because beauty is in the eye of the beholder, and that takes on a whole new meaning when money is involved. What would really benefit the Forest is for control to be wrestled from the traditionalists and placed in the hands of those who have a better understanding of the ecology of existing habitats. A New Forest pony up to its belly in heather and with long grass in its mouth, which isn’t so often seen today. This picture was taken summer 2000, five years before National Park status. Most would agree that the open Forest requires grazing because this is a process that creates not only the look of the place but also very specific environments that are seldom seen elsewhere. Overgrazing on the other hand can cause considerable damage and that is the present situation. There are a handful of wild plants that benefit from a heavy grazing regime, but there are many others that provide food and cover for butterflies and other animals, that are being grazed out of existence. A diversity of plants is necessary for the maintenance of well balanced ecosystems, but this diversity is now being lost – and that’s not an extreme opinion, it’s a matter of fact. 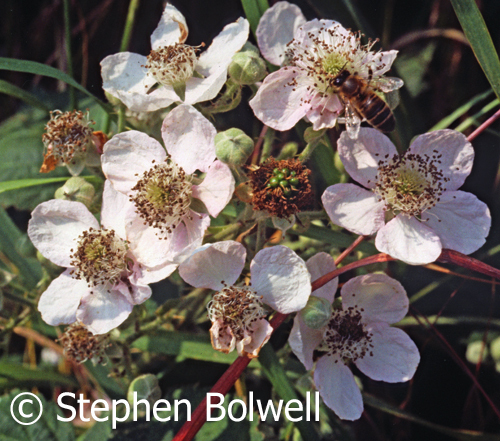 The open Forest now has very little bramble flower for butterflies and other insects to feed upon during the summer. This picture taken in July 1979. Over the years I’ve spent many thousands of hours observing the New Forest through a camera and have gained some understanding of the ecology, as well as the distribution and behaviour of many of the animals that live there. But it doesn’t matter what I think I know about the place, it is the changes recorded by photography – particularly during the last quarter of the 20th Century, that provides evidence beyond dispute, demonstrating a general degradation of the environment directly linked to overgrazing. Many say that the New Forest hasn’t changed much over the years, but if you go away for fifteen years and then come back as I have done recently, you certainly notice a difference. Taken on open heathland not far from Beaulieu the date of this picture cannot be disputed – it was early summer 1992. My young son is in a New Forest pond with his mother; she is blowing raspberries at him and he seems to be enjoying it. This is a fun picture, but it is here for another reason… as a record of the surrounding habitat as it once was. Behind all the splashing a band of gorse and heather can be clearly seen at one end of the pond. Compare this to a picture taken in 2016 two months short of a twenty-four year period, this time looking in the opposite direction across the pond. Spring 2016: The reverse view shows the gorse burnt out, which is not unusual, because along with brashing this is a recognised method of management – gorse soon puts out fresh growth as it is doing here, but look more closely at the ground… there is no regenerating heather. In fact there’s not much growing at all. The reason the place looks so barren is entirely down to the impact of large numbers of herbivores – in this case ponies and cattle – and it isn’t just the munching of fresh growth that has caused the problem, it is also down to trampling, in particular of the heather. I don’t think anybody can say exactly how many stock animals now graze the Forest, but the steady increase over the years is at odds with maintaining balanced ecosystems. Perhaps as many as 170 species have been lost from the New Forest since I started taking pictures in the late 1960s and there can be no doubt that some have disappeared as a direct result of heavy grazing. This picture of the pond was taken on the same day as the previous picture during Spring 2016. 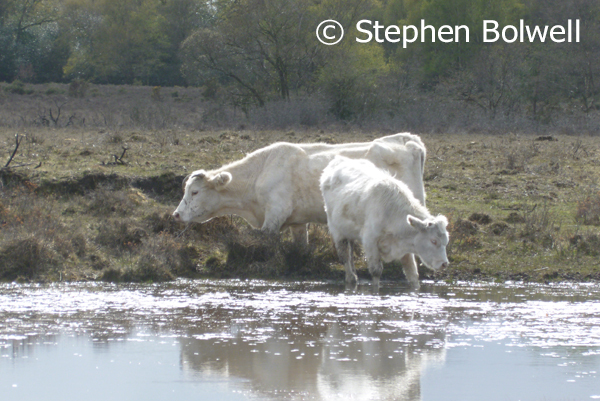 Besides New Forest ponies, a great many cattle are also grazing and their destructive presence is noticeable, especially around the edges of ponds where they turn the banks into mush. 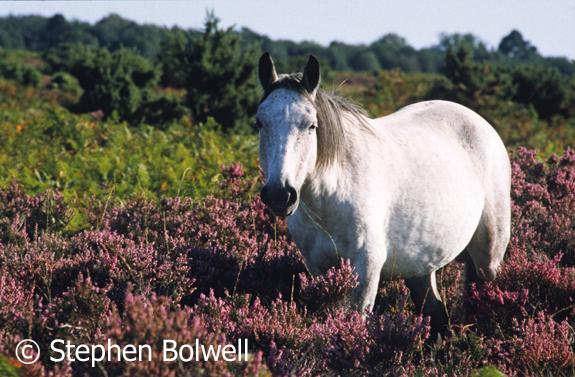 This isn’t to say that ponies and cattle don’t play an important role in managing New Forest ecosystems, just that there are now far too many animals for effective conservation to operate. The question is, why has this been allowed to happen? Some will say that the payment of subsidies and a mis-guided management is to blame, but these are topics that are off limits for discussion. There have always been deep seated attitudes in favour of grazing which has become the ‘Holy Grail’ of New Forest management – not because it is best for the environment, but because it is ‘a way of life’ for the commoners who live there, and their ‘rights’ always take precedence; and this is something that is unlikely to change. A common sense approach would be to manage optimally to benefit New Forest ecosystems, using grazing as one of the many tools available to achieve this end rather than as an end in itself. The pretence is that this is already happening, but nothing could be further from the truth… but I’m old enough to realise that arguments based upon facts and logic don’t always win the day. This is the same pond as discussed above – the cattle from the previous picture would be in the foreground and once again we look back across the pond, but this picture was taken far earlier during the summer of 1978 and because it is a different time of year, it would be unfair to make direct comparisons, but it is impossible not to notice, that back then, there was a lot of heather and other plant growth around the edge of the pond and this has now completely disappeared. Back then, I wouldn’t have considered the cover quite enough for optimal diversity, but today, this habitat is quite devastated. Behind the pond in the above picture is an area of heathland that has, for as long as I can remember, been a good environment for the small and very beautiful silver-studded blue butterfly, an extremely localised species usually confined to heathlands that have been managed to maintain short heather. This can be achieved by controlled burning, a strategy that is not popular with all conservationists because it is so indiscriminate, but done at the correct time of year may be less damaging than an accidental fire during late summer when a burn can go deep into a dry peaty surface, resulting in a recovery time of many years. Whatever the case, the 2016 pictures demonstrate that this heathland has burned recently which should provide nourishment to an otherwise poor soil and aid in the regeneration of heather, but this clearly isn’t happening here. 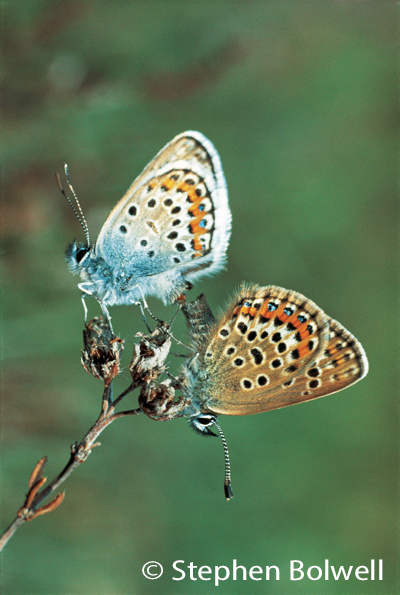 This habitat is no longer maintained the way it was from the 1970s through to the new Millennium, a period when I filmed the silver-studded blue on many occasions. This heathland environment has changed substantially in recent years and not for the better; today it has almost no heather in places where it once grew profusely and is beginning to turn into a lawn. 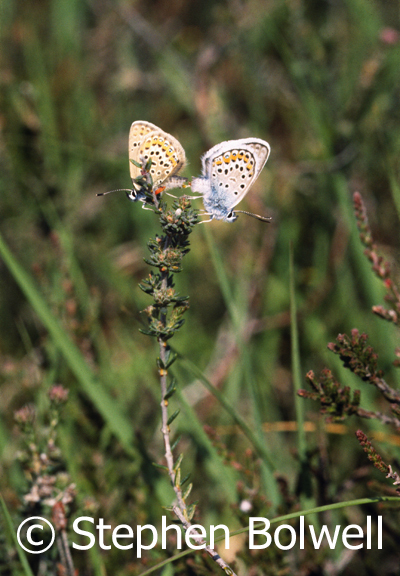 Silver-studded blue butterflies prefer short heather and in a good year for a few short weeks the heathland close by the pond is usually busy with their courtship. There is however a difference between short cropped heather and no heather at all and in heathland close by the pond that is the ys things are going. Another argument for maintaining areas of short heather is that a handful of plant species do very well under a closely cropped grazing regime – usually small plants that are easily overwhelmed by other more robust species. However, it is common to find these mini-botanical wonders in other places where the heather is older and denser; along the edges of well trodden pathways for example, which provides a trampled habitat approriate for their survival. There are clearly areas where plants that are specialists of short heathland can survive without resorting to heavy grazing. Despite this I am not trying to make a case against putting livestock out altogether – I appreciate that they are an effective means of managing open Forest environments but essentially it is a matter of degree. The process should not be used simply as an excuse to graze stock without due consideration for the Forest as a whole. Sadly, the degredation I have outlined on a heathland I am familiar with can now be seen across much of the open Forest. 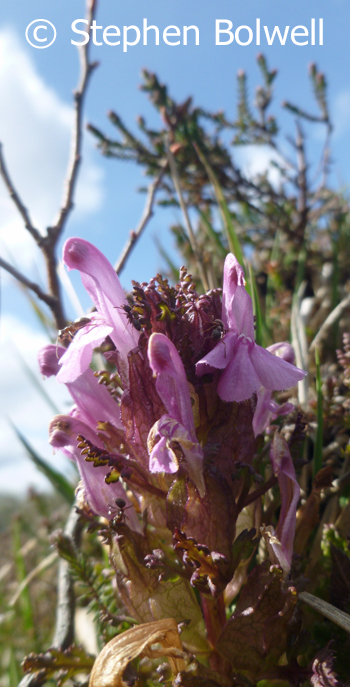 Lousewort, Pedicularis sylvatica another small plant that does well on well grazed heath is attended here by ants. 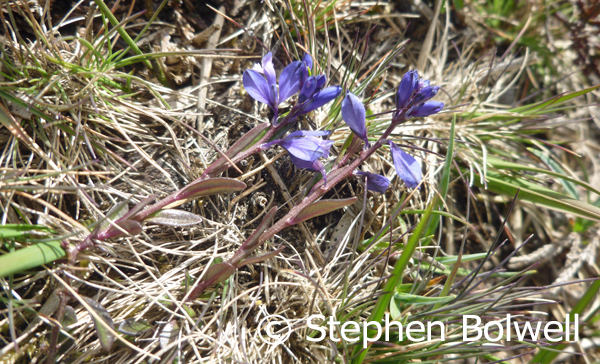 Heath milkwort, Polygala serpyllifolia is just so tiny and is also commonly found on grazed heathland. The present heavy grazing regime inevitably leads to the formation of lawn areas which the New Forest has no shortage of. Fewer grazers would lead to more balanced habitats with greater variations in heather maturity and the regeneration of many other plant species that have been eaten out. The situation is depressing, because back in the 1960s and 70s environmentalists were already moaning about grazing pressures, and it is difficult to fathom how it is possible for things to have become so much worse. It certainly isn’t true that the Forest can’t survive without ‘commoners’ exercising their grazing rights to the present level, although in some quarters it is controversial to even hint that there is a problem. Donkeys grazing the open forest near Beaulieu. An argument that the New Forest pony might become extinct if numbers were reduced is a ridiculous proposition. The possibility that the breed might disappear was far more likely during the Victorian era when efforts were made to improve the ponies by adding new blood – a procedure that very nearly turned the New Forest pony into a completely different animal. 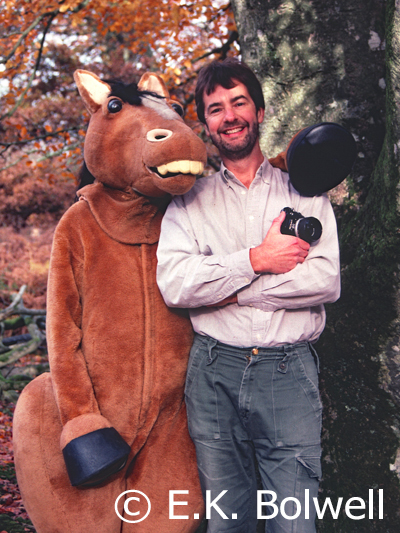 When I was filming on the Forest during the 1990s, there was a concern, that at auction, ponies were less likely to find their way to good homes in this country, and far more likely to end up on the dinner tables of the French; this was accompanied by concerns about how humane it was to transport the poor creatures alive across the English Channel for slaughter in Europe. Don’t get me wrong. I love the New Forest pony, but I believe that the welfare of these animals is best served by not allowing too many out onto the Forest. It should be remembered, that although some of us are sentimental about New Forest ponies and concerned for their welfare, there are others for whom they are just a business. The reality is that there’s no longer a need to ride around on a pony as for a century or more most of us have been using alternative transport. Riding a pony can be a pleasant activity, but few now wish to live in a mythological version of the Middle Ages, although on the Forest there are still those who cherish the idea, just as long as the present grazing subsidies remain intact. 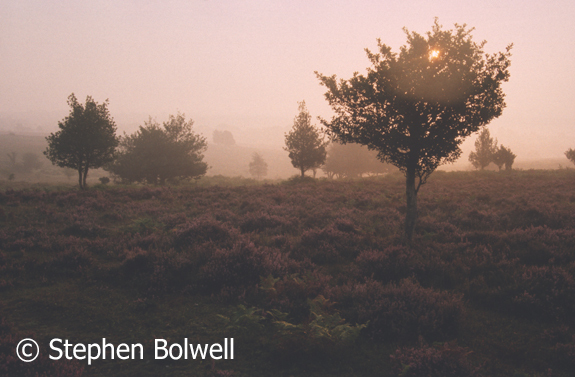 New Forest heathland during late summer 1988 when heathlands were less heavily grazed and consequently healthier – even back then many people thought there was room for improvement, but as always, how bad things really are is just a matter of where you measure them from. Any rational person might consider that lowering the present level of livestock grazing on the New Forest is fundamental to the conservation of species diversity in what is without doubt a unique combination of habitats; but despite evidence to the contrary, there is enormous opposition to any reduction of grazers and the unhindered continuance of what has become an environmentally unsound ‘right’. Now is the time for a more balanced view and this needs to come from an independent source, in particular from people whose judgement is not clouded by the lure of subsidies and who essentially can more clearly differentiate a ‘right’ from a ‘wrong. With thanks to Jen for being the inside of a New Forest pony and the New Forest Visitors Centre for loaning the outside. Next: The Overgrazing of Streamsides and Woodlands.